(Oshkosh, WI.) The city of Oshkosh would like to remind homeowners that the city has an owner-occupied housing rehabilitation program. The program offers a zero percent deferred interest loan that is available to low and moderate income single family property owners within Oshkosh city limits. Loans may be used for roofing, plumbing, electrical, furnaces, painting, and general repairs. Funds may not be used for remodeling and additions. Interested homeowners must complete an application and be approved before any work is done. The annual gross household income may not exceed the amounts listed below. Larger households should call the planning office for income limits. The application deadline is March 15, 2011. For more information, please contact the Planning Division at (920) 236-5059. The Planning Division is located in City Hall in Room 204. 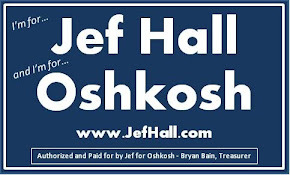 Jef for Oshkosh signs are in!